Outlander Ep. 111 – The Devil’s Mark – What are you reading? Claire’s having a bad day. In the latest episode of Outlander, there’s nothing worse than a single-minded mob, a jealous woman is a dangerous one, and love truly does conquer all. Last week, Claire and Geillis were arrested for witchcraft and on their way to the Thieves’ Hole thanks to bad girl Laoghaire. This week’s show begins with the accused being unceremoniously dumped in said hole like garbage. As they recover from their fall, the two argue about their situation. Claire accuses Geillis of killing her husband Arthur during the feast at Leoch. Surprisingly, Geillis admits she began poisoning her husband with white arsenic months ago. But no worries, Dougal will save them. Umm, well maybe not. Claire reveals Dougal’s banishment and the layer of confidence on Geillis’ face begins to crack slightly. The next morning, the ladies wake to chants of “We’re going to burn the witches.” Lovely. They’re walked through the streets in front of Cransemuir’s residents, who are as warm and inviting as the Thieves’ Hole the accused slept in the night before. At the courthouse, Ned Gowan arrives and announces he will be defending Claire and Geillis, which doesn’t make the crowd or the judges very happy. As the farce goes on, several “witnesses” testify, including Geillis’ servant Jeanie Hume. She throws both women under the bus, and all seems lost until Ned reveals Jeanie’s earlier attempts to leave her employer so she could work at Castle Leoch. 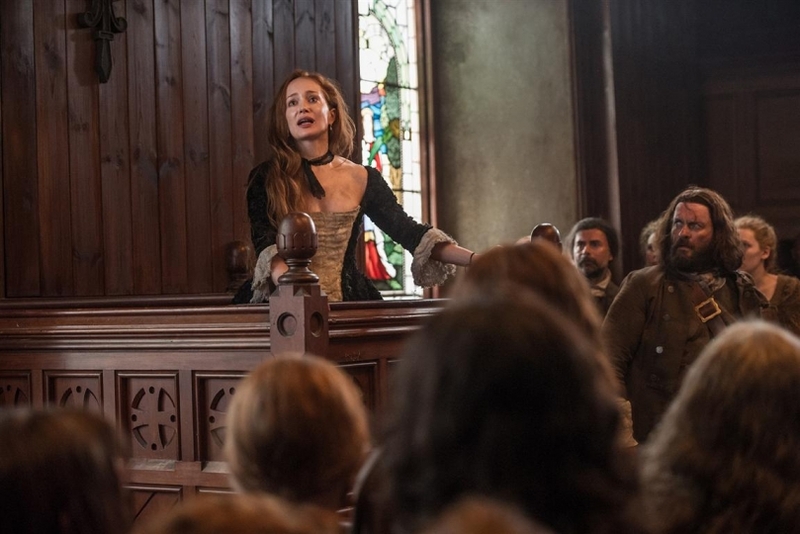 As the trial comes to a close for the day, Claire has a brief chance to speak with Ned about their chances of acquittal (yeah, because witch trials always end with an acquittal). To her horror, she learns that Colum may have had something to do with her arrest. Back in the Thieves’ Hole, the ladies contemplate their fate. Geillis knows that they will be burned no matter what, but has no regrets. For she is a Jacobite and will die knowing she did her part to put Bonnie Prince Charlie on the throne. The trial continues, with bad girl Laoghaire making an appearance. She cries and uses her youth to con everyone that Claire used her witchy ways to steal Jamie. But it was Father Bain who sealed their fate. Surprising everyone, he claimed that Claire saved the boy he thought was possessed and asked that he no longer be priest to Cranesmuir’s parish. So of course the crowd thinks Claire’s a witch if someone as pious (and pompous) as Father Bain would renounce his duties. As the crowd goes nuts, Father Bain turns to look at Claire with a small smile of satisfaction on his face! Who says men of the cloth can’t be as slippery as Beelzebub? During a break, Ned tells Claire to renounce Geillis so she can go free, but she refuses. The women are found guilty, with death as their sentence. Ned goes H.A.M., pulling a pistol on the crowd, but he’s overtaken. 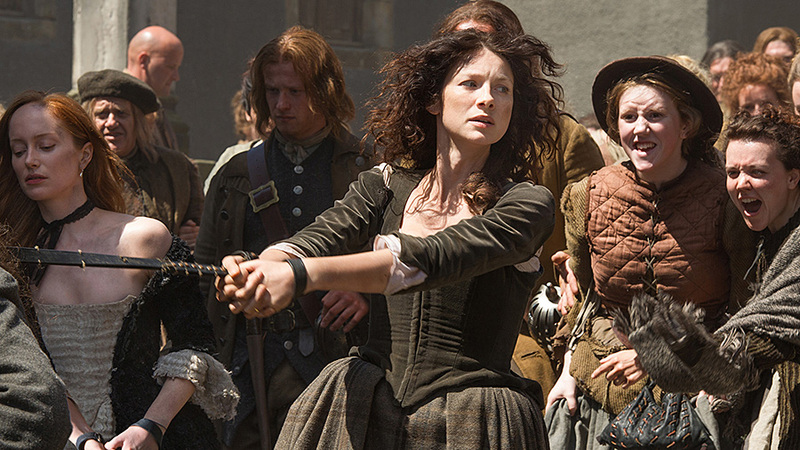 Claire’s potty mouth gets her a good flogging, and then Jamie comes in to save the day. He unsheathes both sword and dirk and says “the first man forward will be the first man down.” Swoon! Geillis then tells the court that she is a witch and Claire is innocent. She confesses to all manner of witchcraft and shows everyone a mark on her shoulder, claiming it to be the mark of Satan, when, in fact, it is from a smallpox vaccination. Geillis is also a time traveler! Before Claire can swallow this latest bit of news, Geillis strips down to show the crowd her swollen belly and says she has lain with the Devil. The crowd goes insane, dragging her outside so they can prepare her for burning, giving the Frasers a chance to escape. Away from the mob, Jamie asks Claire if she is a witch since he’s noticed the same mark on his wife’s arm. She finally tells him the truth and the look on his face was priceless (and damned hot). I’m not sure if I would believe my spouse if he told me a story like that, but amazingly, Jamie does. So he takes Claire back to the stones and leaves her there so she can choose whether to stay or go. Claire is torn between the man she left behind and the one she’s with now. Both love her dearly and vice versa. But it’s Jamie she chooses, leaving Frank, the future and baths behind. And if you weren’t choked up seeing that lone tear of joy on Jamie’s cheek then you are truly dead inside! Will the Frasers find happiness at Lallybroch? What of Geillis and her baby? And has Laoghaire finally realized that she hasn’t a chance in Hell of being with Jamie? That tear on Jamie’s cheek didn’t just have me choke up but sobbing! I loved this episode, it has to be my favourite so far. Mine too! Thanks so much for reading!